USMotoman Discount Motorcycle Parts Store. 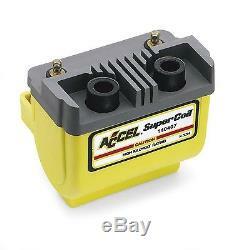 ACCEL Super Coil - Yellow - 140407. ACCEL engineers designed these coils special low-resistance primary winding to match the operating characteristics of factory and aftermarket CDI systems. Maximum performance with fast rise times. Faster rise time, increased spark energy and longer spark duration results in up to 45% higher voltage than O. Unique molded case with finned top prevents carbon tracking. Using the wrong coil may damage your motorcycles electronic ignition module. To determine your ignition type, complete the following test. Determine whether the type of coil you are replacing is a high tower coil. These coils will NOT replace single tower coils. Using a volt meter or 12V test light, hook the positive lead to the positive post and the negative lead to the ground on one of the stock coils.. Turn the ignition on, but DO NOT engage the starter button.. If there are 12V at the coil, the motorcycle has an inductive type ignition. If there is no voltage at the coil, then the motorcycle has a CDI ignition because. The power goes to the control box first.. Primary Resistance is 3.0 Ohms. Dual-fire w/ electronic ignition (2.3 ohm). We strive to exceed your expectations and pride ourselves on superior customer service. Our team of in-house experts is standing by to help. Attention International Shoppers Outside The U. The item "ACCEL Super Coil Yellow 140407" is in sale since Monday, May 15, 2017. This item is in the category "eBay Motors\Parts & Accessories\Motorcycle Parts\Other Motorcycle Parts".